3.6 3.6. Amelanotic melanoma. Main false negative diagnosis: Pyogenic granuloma, inflammatory nodules et al. False Negative Diagnosis – cite! False Negative Diagnosis (message) False Negative Diagnosis – participate! False negative diagnosisis the identification of the nature and cause of a certain phenomenon. Diagnosis is used in many different disciplines with variations in the use of logic, analytics, and experience to determine "cause and effect". In systems engineering and computer science, it is typically used to determine the causes of symptoms, mitigations, and solutions in dermoscopyThe examination of [skin lesions] with a 'dermatoscope'. This traditionally consists of a magnifier (typically x10), a non-polarised light source, a transparent plate and a liquid medium between the instrument and the skin, and allows inspection of skin lesions unobstructed by skin surface reflections. Modern dermatoscopes dispense with the use of liquid medium and instead use polarised light to cancel out skin surface reflections. is an error occurring when a malignant tumor displays characteristics suggestive of a benignis any condition that is harmless in the long run tumor. Obviously, as compared to false positive diagnosis, this type of error is significantly more important, since overlooking a cancer might result in undesirable consequences both for the patient and the doctor. It has to be mentioned that the term “dermoscopically false negativeThis glossary term has not yet been described.” cancer should not be considered equivalent to the term “dermoscopically featureless” cancer. A “featureless” malignant tumor does not display any of the expected dermoscopic criteriameasure of how well one variable or set of variables predicts an outcome, whereas a “false negative” one, not only lacks expected criteria, but also shows criteria suggestive of a benign tumor. Therefore, false negative cancers are much more likely to escape detection. All the main malignant skin tumors might occasionally be dermoscopically false negative. 1.1. Non-pigmentedThis glossary term has not yet been described. BCC. Main false negative diagnosis: Dermal nevusThis glossary term has not yet been described. The dermoscopic hallmark of BCC is its vascular pattern, which consists of the so-called “arborizing” vesselsThis glossary term has not yet been described.. These are ideally stem vessels of large caliber, projecting sharply in focus, branching in thinner vessels and finally terminal capillaries and typically cross the centre of the tumor. However, deviations of this “ideal” pattern are frequent. Occasionally, the branches might be not very evident and the vessels might project as multiple short linear curved structures, somehow mimicking the so-called “comma vesselslinear curved short vessels dermal nevi” of dermal neviThis glossary term has not yet been described.. Often, this is just an optical illusion caused by pressure applied during dermoscopic examination. Thus, dermoscopic examination of nodular lesions should be either non-contact (polarized) or at least with the use of an immersionThis glossary term has not yet been described. fluid or gel to minimize the applied pressure. As compared to non-pigmentedThis glossary term has not yet been described. BCC, pigmented variants are even easier to recognize, based on the unique morphologyThis glossary term has not yet been described. of BCC-specific pigmented structures (leaf-like structures, spoke-wheel, areas, concentric structures, blue dotsDots are small, round structures of less than 0.1 mm in diameter that have a red color when corresponding to blood vessels; however, when due to melanin, their color ranges from black, brown, to blue-gray depending on the depth and concentration of the melanin in the skin (Tyndall effect)./globulesThis glossary term has not yet been described./nests). However, when the pigmented basaloid nests are very large and heavily pigmentedThis glossary term has not yet been described., they might result in diffuse blue pigmentation, which could mimic the pattern of blue neviThis glossary term has not yet been described.. To address this problem, it has been suggested that the diagnosis of a blue nevusis a type of melanocytic nevus that clinically and dermoscopically will appear blue should always be confirmed by the history of a long-standing stable lesion. The dermoscopic pattern of SCC depends on the grade of histopathologic differentiation. Well-differentiated SCC is dermoscopically typified by white colorColor (American English) or colour (Commonwealth English) is the characteristic of human visual perception described through color categories, with names such as red, yellow, purple, or blue., and the main structures are white perifollicular circles (highly specific), white perivascular halos, white structureless areas and hyperkeratosis/keratin. In contrast, poorly differentiated SCC is displays an unspecific dermoscopic pattern consisting of a red predominant colour, numerous polymorphic vessels and/or bleeding. Rarely, SCC might mimic a benign tumor. Well-differentiated SCC is a highly keratinizing tumor. When keratinisation is very extensive, not allowing the visualisation of underlying features, SCC might be quite similar to benign keratinizing tumors, mainly seborrheic keratosisThis glossary term has not yet been described. and common wart. A simple clue to minimize this problem is the removal of the superficialThis glossary term has not yet been described. keratin (ex with an alcoholic solution). 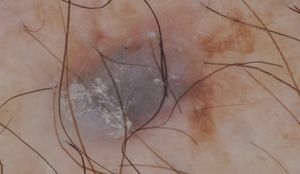 Another confounding dermoscopic feature is the so-called “white perivascular halo”, since this structure can be seen in virtually all keratinizing tumors. Therefore, an SCC showing numerous whitish halos might be misinterpreted as an irritated seborrheic keratosis or a common wart (false negative). Some cluesEvidence, in an investigation to discriminate between SCC and irritated SK do exist: irritated SK is usually characterized by a symmetric distribution of structures (vessels surrounded by halos), in contrast to the more uneven arrangementThis glossary term has not yet been described. of features in SCC. Furthermore, SCC rarely displays multiple white halos surrounding vessels as the only dermoscopic feature. If present, usually white halos in SCC are combined with white circles surrounding hair follicles or structureless whitish areas. The dermoscopic pattern of poorly differentiated SCC is highly unspecific, since the same features can also be seen in several other malignant tumors like Merkel cell carcinoma, atypical fibroxanthoma, melanotic melanomaThis glossary term has not yet been described., adnexal carcinomas etc. However, poorly differentiated SCC is almost never false negative, since no benign tumor is known to display a similar dermoscopic pattern. 3. MelanomaThis glossary term has not yet been described. In the field of melanoma, the terms “featureless” and “false negative” are quite overlapping. This is because melanoma and nevi share several similar dermoscopic criteria, and the main difference is their asymmetric or symmetric distribution, respectively (ex. regular networkThis glossary term has not yet been described. vs irregular networkThis glossary term has not yet been described., regular globulesGlobules with minimal variability in their color, size and shapeGlobules with minimal variability in their color, size and shape vs irregular globulesGlobules with variability in color, size, shape or spacing and distributed in an asymmetric fashion etc). Therefore, a melanoma lacking melanoma-specific dermoscopic criteria might very possibly be interpreted as a nevus. The morphologic overlap between early melanomas and “atypical” nevi is also discussed in the chapter “false positive diagnosis”. It should be underlined that the majority of the known melanoma-specific dermoscopic criteria are usually absent in melanoma in situnot seen to be spreading from a localized position. Therefore, it might be possible that a melanoma in situ might be dermoscopically assessed as a nevus. To minimize this risk, managementThis glossary term has not yet been described. rules based on the overall patient’s contextThis glossary term has not yet been described. have been suggested. Furthermore, 3 new predictors of melanoma in situ have been recently introduced: dark, irregularly-shaped small structures (DISSS), prominent skin markings and angulated lines (polygonslines angulated or polygonal (non-facial skin)), the latter 2 mainly seen on sun-damaged skinThis glossary term has not yet been described..
Nevoid melanoma represents a rare melanoma subtype that clinically and histopathologically mimics a nevus. DermoscopyThe examination of [skin lesions] with a 'dermatoscope'. This traditionally consists of a magnifier (typically x10), a non-polarised light source, a transparent plate and a liquid medium between the instrument and the skin, and allows inspection of skin lesions unobstructed by skin surface reflections. Modern dermatoscopes dispense with the use of liquid medium and instead use polarised light to cancel out skin surface reflections. might improve the recognition of nevoid melanomas, since some of them display a multicomponent patternThis glossary term has not yet been described., which is considered suggestive of melanoma. A proportion of nevoid melanomas, however, mimic dermoscopically a dermal nevus, displaying a relatively symmetric globular patternThis glossary term has not yet been described.. A possible clue might be the presence of polymorphic vessels instead of the “comma” vessels that would be expected in a dermal nevus. 3.3. Spitzoid melanoma. Main false negative diagnosis: Spitz/Reed nevusThis glossary term has not yet been described. The potential of spitzoid melanoma to perfectly mimic a Spitz or Reed nevus has been extensively reported in the literature. Due to this significant morphologic overlap, specific strategies and guidelines on the management of spitzoid-looking tumors have been released by the International Dermoscopy Society. Occasionally, melanoma might have a verroucous surface, because of hyperkeratosis and epidermal hyperplasia, acquiring an overall aspect similar to a seborrheic keratosis. A recent study highlighted that the majority of seborrheic keratosis-like melanomas can be uncovered by dermoscopy, since they display one or more of the following melanoma specific criteria: blue-white veil, pseudopodsBulbous and often kinked projections seen at the lesion edge, either directly associated with a network or solid tumor border., streakslines radial (always at periphery) streaks Reed nevus melanoma recurrent nevus, atypical networkNetwork with increased variability in the color, thickness, and spacing of the lines of the network; asymmetrically distributed; gray color and the blue-black sign. However, approximately 20% of melanomas displayed dermoscopic features suggestive of seborrheic keratosis (false negative). The multivariate analysis revealed than only the blue-black sign remained a potent melanoma-predictor. Regression structuresThis glossary term has not yet been described. (white scar-like depigmentationThis glossary term has not yet been described. and blue/gray granules/pepperingGray dots) are included among the classic melanoma-specific criteria. However, in fact they represent criteria suggestive of the regression process, since very similar features are seen in regressive nevi and regressive seborrheic keratosesThis glossary term has not yet been described./solar lentiggines (LPLK). The feasibility to accurately classify a regressive lesion depends on the stage (extension) or regressionThis glossary term has not yet been described.. When the regression is partial and parts of the initial tumor are still present, then the diagnosis might be possible. If, in contrast, the regression is so extensive that no remnants of the primary tumor are evident, a safe diagnosis is impossible. The only safe strategy to address this problem is to perform a biopsy/exciosion of any fully regressive lesion. 3.6. Amelanotic melanomatype of skin cancer in which the cells do not make melanin. Main false negative diagnosis: Pyogenic granulomaThis glossary term has not yet been described., inflammatoryThis glossary term has not yet been described. nodules et al. Amelanotic melanoma represents the most important trap for clinicians. In fact melanotic melanoma is usually featureless, but very rarely acquires a pattern highly suggestive of a benign tumor. Strategies on how toGives basic instructions and directions to someone on the methods for doing or making something. approach non-pigmented tumors can be found in other chapters. The main false negative diagnosis of melanotic melanoma is pyogenic granulomaThis glossary term has not yet been described., which led experts to suggest that the diagnosis pyogenic granulomas should be histopathologically confirmed in all (if possible) cases. ↑ 1.01.11.2 Lallas et al. : The dermatoscopic universe of basal cell carcinomais the most common skin cancer, and one of the most common cancers in the United States. While BCC has a very low metastatic risk, this tumor can cause significant disfigurement by invading surrounding tissues. Dermatol Pract Concept 2014;4:11-24. PMID: 25126452. DOI. ↑ Altamura et al. : DermatoscopyThe examination of [skin lesions] with a 'dermatoscope'. This traditionally consists of a magnifier (typically x10), a non-polarised light source, a transparent plate and a liquid medium between the instrument and the skin, and allows inspection of skin lesions unobstructed by skin surface reflections. Modern dermatoscopes dispense with the use of liquid medium and instead use polarised light to cancel out skin surface reflections. of basal cell carcinoma: morphologic variability of global and local features and accuracy of diagnosis. J. Am. Acad. Dermatol. 2010;62:67-75. PMID: 19828209. DOI. ↑ Lallas et al. : The clinical and dermoscopic features of invasive cutaneous squamous cell carcinomaThis glossary term has not yet been described. depend on the histopathological grade of differentiation. Br. J. Dermatol. 2015;172:1308-15. PMID: 25363081. DOI. ↑ Argenziano et al. : Slow-growing melanoma: a dermoscopy follow-up study. Br. J. Dermatol. 2010;162:267-73. PMID: 19785607. DOI. ↑ Lallas et al. : ManagementThis glossary term has not yet been described. rules to detect melanoma. Dermatology (Basel) 2013;226:52-60. PMID: 23485555. DOI. ↑ Longo et al. : Morphological features of naevoid melanoma: results of a multicentre study of the International Dermoscopy Society. Br. J. Dermatol. 2015;172:961-7. PMID: 25388239. DOI. ↑ Lallas et al. : Update on dermoscopy of Spitz/Reed naevi and management guidelines by the International Dermoscopy Society. Br. J. Dermatol. 2017;. PMID: 28118479. DOI. ↑ Carrera et al. : Dermoscopic CluesEvidence, in an investigation for Diagnosing Melanomas That Resemble Seborrheic Keratosis. JAMA Dermatol 2017;153:544-551. PMID: 28355453. DOI. ↑ Zalaudek et al. : Clinically equivocal melanocyticThis glossary term has not yet been described. skin lesions with features of regression: a dermoscopic-pathological study. Br. J. Dermatol. 2004;150:64-71. PMID: 14746618. This page was last modified on 26 July 2018, at 01:36.